22-May-2016 -- While planning a Spring vacation in the U.S. Pacific Northwest, I naturally looked for Degree Confluence Points to visit en route. Looking at the map of my previous confluence visits, I noticed a line of several points on the 119 Degree West line of longitude that I had yet to visit. Many of these were in remote areas, and were ‘Forgotten Confluence Points’ - visited just once in the early ‘00s, but not visited again since. So I made plans to try to visit these points. 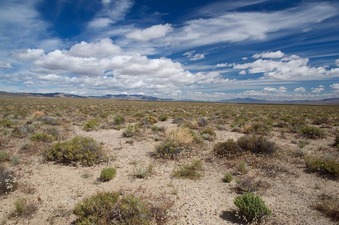 But first, I wanted to revisit this point in the desert of northern Nevada. I had previously visited it almost 10 years ago in June 2006; there had been no recorded visits to it since then. Yet the point is quite easy to visit; it lies just 1/3 mile east of a dirt road. I was curious to see how the point had changed over the last decade. I noticed exactly one change: There is now a ‘geocache’ box at the site. Coincidentally (or more likely not coincidentally) the box was left under a bush, right next to a rusted steel pipe fixture that I had noticed (and photographed) 10 years ago.